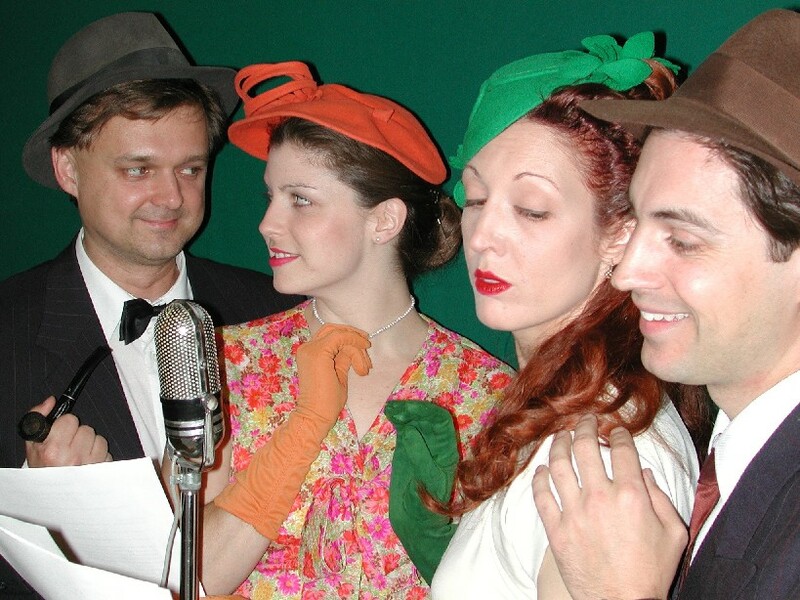 Social media has played a big part in the success of Decoder Ring Theatre, a Canadian radio theater troupe that produces audio plays reminiscent of old-time radio. Their two mainstay characters, Red Panda and Black Jack Justice live in Toronto (Red Panda during WWII, and Black Jack a few years after). Decoder Ring Theatre also produced six of my radio plays last summer. I interviewed Decoder Ring founder and leader Gregg Taylor, and asked him about how social media has played a success in what they’ve done, and what their strategy has been over the years. These are his answers. 1) How much of your success do you attribute to your own social media networks vs. sheer doggedness and word of mouth? I kind of lump our social media presence under the broad heading of “sheer doggedness and word of mouth”, so it’s hard for me to seperate the two! Really, Facebook and Twitter have evolved into ways for us to be a part of the daily lives of those listeners who want that kind of relationship. I started both pages at the specific requests of listeners, and I do try and keep the content on each a little different, for the benefit of those who follow both pages and also our fan boards at audiodramatalk.com. Yes, I certainly do let our corner of Facebook and Twitter know when a new episode goes up, or a new book comes out, because let’s be honest, everyone loses track of these things sometimes, even when you’re as predictable as we are (new episodes on the 1st & 15th of every month, year-round!). But I do want our social media presence to be just that… social. Facebook offers those listeners a chance to react not just with me, but with each other, to discuss what they like and what they don’t (and of course, in the process, have us appear in the timelines of their friends)… Twitter started out as a little more “behind the scenes/this is what I’m working on right this second”, and still is that kind of sneak-peek for those interested, though by extension it also has become a “welcome to my brain”… again, it’s like the DVD extras for the really big fans. I think we pick up some new listeners that way, but for me, it’s about the enhanced experience, being a part of the extended Decoder Ring family. 2) Are you seeing a lot of traffic coming in from outside referrals (i.e. Twitter, Facebook), as opposed to repeat listeners? Where do they come from? Listenership has been solid and steady. It’s often hard to tell where it comes from, in a way… when you’re just starting out and you get an extra 80 downloads it’s like “Holy Hanna, look at that spike!”. It has to be a pretty big event for it to really register as an abberation in our patterns these days. Well, big by our standards anyway. I think we’re getting to be big enough now to really properly understand just how tiny we are… we’re comparing ourselves to outfits with gobs of money and wondering just what we’d have to do to make an impact. There have been some serious spikes. Roger Ebert gave us a shout-out a year or two ago, and that was nice. He tweets a LOT though. I’ve followed him on and off, and there’s no way you can check out everything he mentions unless you have a powerful amount of time on your hands. Still, I have a lot of respect for him and for him to think we were worthy of a mention was exciting. I guess the biggest single event in terms on new listenership was when we unexpectedly got profiled by the BBC’s technology program last year… just a little piece, but it played all weekend on BBC and around the world on the world service. That was large. Our UK numbers passed Canada immediately and never looked back, which is pretty surprising, considering that the Red Panda Adventures is pretty much the only pulp hero universe in which you’ll hear about the Dieppe Raid, or have a cameo by WLM King, our wartime PM. I guess what’s great about our listenership is that once we have someone hooked, they tend to stay with us forever, and they get that wonderful evangelical zeal that folks on the internet so often have when promoting things that they love to everyone they know. That’s what really makes us go. 3) What’s your biggest source of listeners? America. I know that’s not exactly what you’re asking, but I think I ran on a bit in the last question. We have listeners all over the US, but seem to have some super-concentrated pockets in Washington State, in Southern California, in Texas and New York and in Iowa. Lots of Iowans. Don’t seem to have a lot in the Boston area, though. I keep shouting-out to my beloved Patriots and I rarely get a holler back. It is just possible that the crossover audience between NFL football and on-line old-time-radio-style mystery and superhero adventure programs isn’t as great as I imagine it must be. Still, never hurts. Go Pats. 4) You were recently in a radio theatre voting contest. When I last looked a few weeks ago, you were 3 – 4 TIMES ahead of the entire pack, if you had combined all their scores. How did you spread the word about that? Yeah, I try not to do that stuff too much. I did mobilize our social media folks/fanboards to push for the Podcast Award in 2010, mostly because I was sick and tired of not winning it. Then we won it and it really changed absolutely nothing. Nice to win, made no impact on our audience. In all fairness, I’m not sure “Cultural/Arts” is really a high impact category for a lot of people. I’m sure it carries more weight in other divisions. Actually, come to think of it they never even sent us an award, or certificate or anything. Still, like I say, it was exciting to win, and I bugged people quite a bit about that. But I don’t like to do it too often. 5) Did you end up winning? Voting is only one part of the process. There are 6 official judges, and the on-line voting counts as a 7th judge. Who can tell? Maybe winning the popular vote in a landslide will actually work against us. There are also some folks in the audio theatre world that don’t like what we do because we’re old-school. We’re telling stories set in the era when radio was king, but we’re not doing that because it makes us more or less marketable, we’re doing it because these are the stories we want to tell. You have to love what you do, or you can’t expect anyone else to. We focus on the story and the characters, rather than sound effects, because those are the stories I want to write and we want to create. And also to hear. I think that love comes through in the work, and I think it’s why we have the audience that we do. In any event, there are some great shows in the running, and the judges are some very, very qualified people, I’ll respect their decision whatever it is. 6) Did you feel even a little guilty for exercising your social networks for this contest, almost like you had a social media cheat code? No way, baby. We have an audience. That’s what everyone putting themselves out there on the Internet hopes for first, and most never find. We’ve developed a group of people who are passionate about the work that we create, that want to be involved and to help where they can, and we’ve developed networks that allow us to reach out to some of those most passionate people directly. We’d be fools not to use it. It would be like wanting to fail. We can’t influence how the judges will vote, but if you put something out there that’s in our power to effect, by golly we’re going to go out there with our small but hardy band of internet ruffians and get it done. 7) How have you gotten most of your social media connections? We promote them on the website, and periodically give them an audio plug in the programs themselves, for those 50% or so of our listeners who get the programs from a podcatcher like iTunes and probably never visit the site directly. It gives our champions one more way to try and convert their friends to our cause. 8) Are they listeners who found you on social media, or are they people who found you on social media and started listening? I think both. It’s a bit of a longer shot on Twitter… “Hmmm… this guy seems to share my love for the wisdom of @GoddamnBatman, maybe I’ll listen to his radio show…”, but it happens. 9) How would you incorporate your social networks into a Decoder Ring production or promotion? We have done a number of “live tweet recording days” from the studio, with various members of our ensemble popping on with comments throughout the seasion. Those were pretty fun. A lot of tweets in a short time though, and I try not to take up too much real estate on anyone’s feed. 10) What advice would you give to radio theatre and live theatre troupes who want to start using social media for their own promotions? Do it, but be yourself. You can’t just be out trolling for listeners/customers. You have to be giving something of yourself in the process, and it can be hard to keep up. I still haven’t gone near Google+…. really, I just haven’t had the time. I need to see some evidence that it’s going to stick before I can carve off another piece of myself for that! Yep. We’ve thought about it. It hasn’t happened for a few reasons (a) We run about a year ahead of releases, so it’s spoiler city (b) Making good video is a lot more time/trouble/expense than making good audio and (c) It can be a pretty big distraction when we’re already trying to get a lot done in a short time. Someday!